Found in the temperate and tropical oceans in the world, Thresher sharks are lamniform sharks from the Alopiidae family. 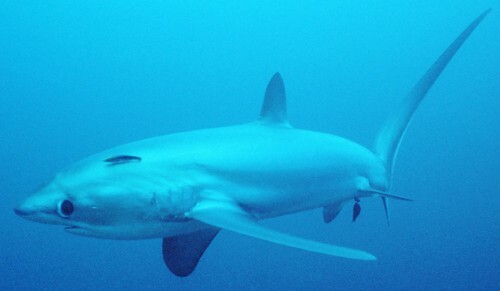 There are 3 species of the thresher shark in the Alopias genus. The reason why this shark was dubbed the thresher shark, is because it has a distinctive thresher-like tail which can actually be as long as the sharks’ body! Although is is occasionally sighed in shallow waters, the thresher sharks prefer the open ocean and venture no deeper than 500 meters (1600ft). Common threshers are found in the coastal water over continental shelves, such as in the North Pacific. They are rare in the Western and Central Pacific though. However, where they are absent, the bigeye and pelagic thresher sharks are more common. However, a thresher shark was recently seen on live video footage that was taken from a monitoring feed from BP’s Macondo oil well. This was the one that blew out the Gulf of Mexico. With this video monitoring, it shows evidence that the thresher sharks do dive deeper than 500 meters than previously thought was their limit. However, we do not know whether this is normal behaviour for them, or whether they have adapted. As mentioned above, they have an extremely long tail. This tail is used as a weapon in order to stun their prey. The common thresher has the biggest tail as it can reach a length of 6.1m (20ft) and can weigh 500 kg (1,100 lb.) The bigeye thresher is next, at 4.9m (16ft) and the pelagic thresher is the smallest at 3m (10ft). They are slender creatures (shark-wise, at least) and have small dorsal fins but large pectoral fins. Their eyes are small (except for the bigeye thresher shark) and are positioned forewards of the head. Their color ranges from purple, blue, and brown. However, the species can be distinguished by their dorsal color. Common threshers are dark green, big eye threshers are brown, and pelagic threshers are blue. Thresher sharks eat open water schooling fish such as mackerel, juvenile tuna, and bluefish. They also eat squid and cuttlefish as part of their primary diet. However, they have also been known to eat seabirds and crustaceans. Unfortunately like all large sharks, the thresher shark is vulnerable to overfishing. It is hunted for its meat, liver oil, skin (for leather), and their fins (for shark fin soup). 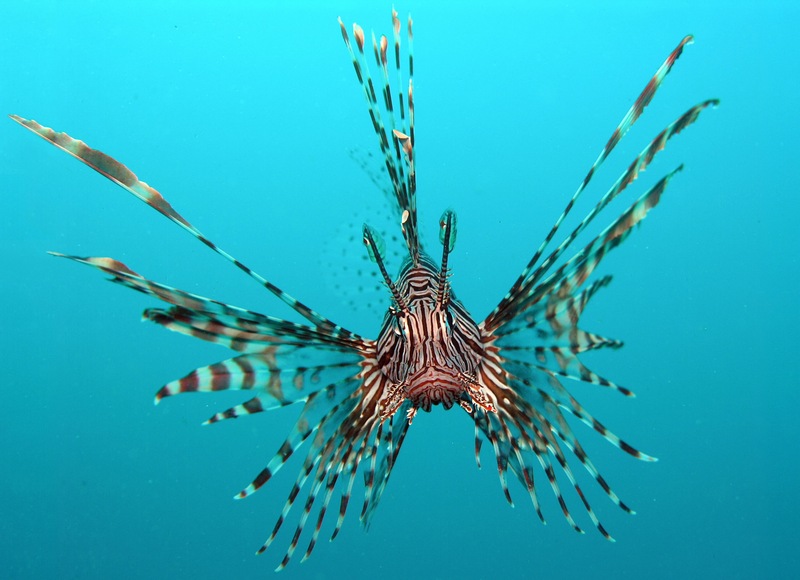 They are not a threat to humans, but they have been known to sometimes hit divers with their upper tail lobe. Despite this, they are a prized gamefish in South Africa and the USA. It is a popular recreational fishing target in Baja. 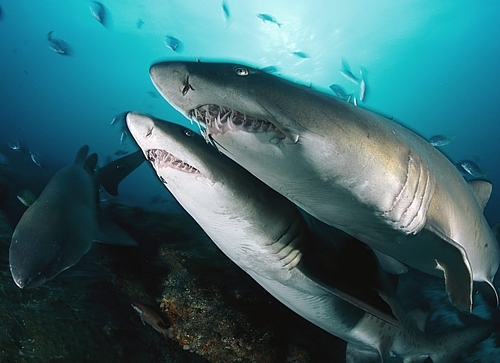 All 3 sharks are listed as being in the ‘vulnerable to extinction’ list and now their populations are managed in some areas as they are valuable both commercially and as a recreational gaming fish. I was visiting Sandy Cove near Digby, Nova Scotia today and we found what was clearly a thresher shark on washed up on the beach. It had passed away recently and had no signs of being attacked. The were recent storms here in Nova Scotia so we believe he may have gotten caught up in the waves and pushed up shore. 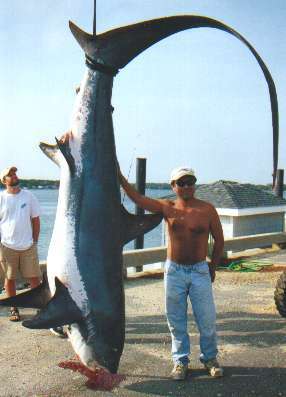 But that still leaves the question what was a thresher shark doing way up north in the Atlantic ocean. It was a young thresher, it was barely 6 feet long. I can send you pictures if you want. I am sure it is a thresher because has soon as i saw it I could tell by the long tail. His back was very dark and greyish however. It’s a beautiful creature so little known about them! We must protect them!